Think you have to be loud and brash to be successful in business? Think again. The strengths and traits of the typical introvert lend themselves well to entrepreneurship, as well as “intrapreneurship” and a range of business roles. In The Introvert Entrepreneur, professional coach Beth Buelow shows readers how to harness their natural gifts (including curiosity, independence, and a love of research) and counteract their challenges (such as an aversion to networking and self-promotion). She addresses a wide range of topics --from managing fears and expectations and developing a growth mindset to networking, marketing, leadership skills, and community-building--informed by interviews with introverts who have created successful businesses without compromising their core personality. Beth L. Buelow is a certified coach, corporate trainer, and professional speaker. Since founding her company, The Introvert Entrepreneur, in 2010, along with her popular podcast of the same name, she has established herself as a go-to expert for introvert entrepreneurs around the world. "What introverted dreamer wouldn't want a smart, successful mentor available in the quiet of their living room? Beth Buelow is that mentor, and The Introvert Entrepreneur reaches introverts where they live: inside, with their hopes, fears and questions. An indispensable guide." 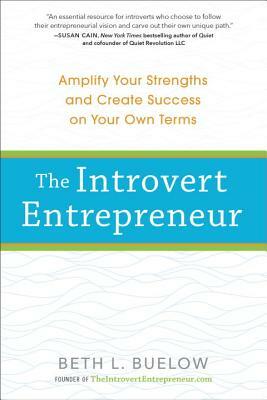 "Finally, a book about entrepreneurship that celebrates the gifts, skills, and strengths of introverted business owners. Beth does a beautiful job of helping introverts build a thriving business on their own terms -- without having to pretend to be extroverts. The stories, tools and frameworks will guide and support effective, sustainable business growth for introverts in every type of business."